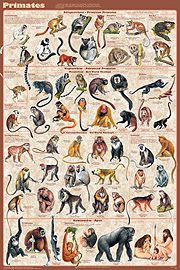 Mammals is one of the four posters in our vertebrate orders set. 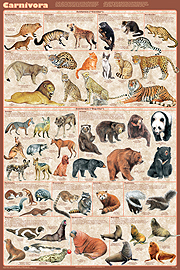 Primates and Carnivores are the first two titles in our new mammals series. Each poster is devoted to a single order and presents all of the families within that order. Mammals are the most well-known animals on Earth. They were named for their unique mammary glands which produce milk to feed the young. 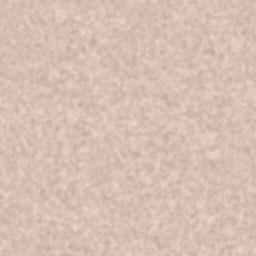 This soft tissue does not fossilize. To differentiate modern mammals from their more primitive ancestors, paleontologists use a distinguishing feature shared by all living mammals: the three middle ear bones used for hearing. These bones are now the defining characteristic of the clade. 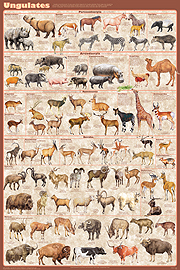 Animals are now being reclassified in accordance with the new cladistic classification system. None of the new systems proposed for mammals has been widely accepted, so the Linnaeus classification system is still used. Under it there are 29 orders, 153 families, and about 1,200 genera. There are approximately 5,400 species, ranging in size from the 1.2 inch Bumblebee Bat to the 110 foot Blue Whale. 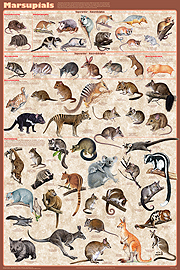 Our great new mammals series of posters explores the largest and most popular orders. They identify and present every family in the order. 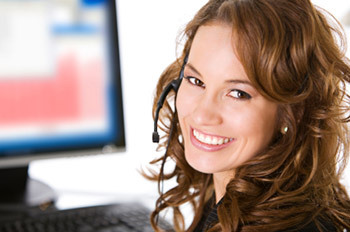 Each is briefly introduced, and the number of known species is cited. A great many beautiful, highly-detailed and anatomically accurate illustrations show an excellent selection of representational species. 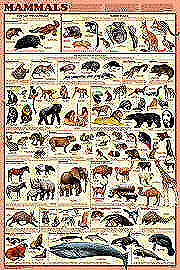 North American mammals are shown whenever possible. All of the titles in this series have the same graphic design, making them a matched set. The warm colors go well with almost all decors.